Published by Joshrooms under community news on May. 01. 2012. Servers went down, servers came back up, and we were presented with a nice healthy amount of patch notes for our trouble. There were a lot of little fixes in this weeks maintenance, and some little quality of life improvements as well. Almost all areas of the game have been hit with some fixes this week, not surprising since the game has needed some bugs ironed out since the release of 1.2. Published by Joshrooms under community news on Apr. 12. 2012. Players can now unlock a wide variety of rewards by leveling characters and reaching new Legacy levels, including buffs for your characters, unlocking additional Species choices for every class, and upgrades for your personal Starship. Build your own Legacy with the new Family Tree! Lost Island, a new Flashpoint, is available for play! Having uncovered the sources of the Rakghoul plague outbreak in the Tion Hegemony, players must travel to Ord Mantell and confront Dr. Lorrick, the mad scientist who engineered this horrific biological weapon. Explosive Conflict, a new Operation, is available for play! The Trandoshan mercenary warlord Kephess has seized the planet Denova, a world rich in resources valuable to the war effort. Players must assault his war camp, situated atop a mountain in densely-wooded terrain, fighting Imperial defectors and heavy war machines along the way. 8- and 16-player Story and Hard Modes are currently available for this Operation. Novare Coast, a new objective-oriented Warzone on the planet Denova, has been added to the game. This Warzone, like Huttball, supports same-faction matches if there are not enough members of the opposing faction to be found. New repeatable high-level daily missions are available in a new area on Corellia, the Black Hole! Guilds now have access to a shared Guild Bank, accessible on the Fleets, with expandable storage. A new tier of gear has been added for both PvP and PvE. Players can now customize their User Interface by moving and resizing UI elements! A new level 50 World Boss with a challenge for a well-coordinated 16-player Operation Group has been sighted in the Gormak Lands region on Voss. Are you as excited to check out all these new features as we are? Let us know what you think of the changes in the comments below! Published by Joshrooms under community news,PvP on Mar. 31. 2012. PvP is going to be changing in 1.2. Now this is no surprise for most players, BioWare has be very vocal about their desire to improve on PvP with the launch of their newest game update. But some players (myself included) may be wondering exactly what that means. Sure, some info has been made public through various sources, but there has not been a nice long post from a developer talking about all the changes we can expect to see. Gabe Amatangelo made it his mission to change that. Gabe went the distance and made a huge blog post about what players can expect to see on the PvP horizon. While he does emphasize that when the new update launches the ranked PvP will be considered in “Pre-Session”, with more improvements coming the the future, he still does a fantastic job on outlining what we all can expect to see in our PvP future. Gabe talkes about Ranked Warzones, the new rewards system, the AFK Vote Kick option, and some new ststs players can expect to see at the end of the match. Even if you just dable in PvP now and again it is well worth a read, and guilds who plan on grouping up for some Ranked Warzone madness need to head over and give it a read asap! You can find the full post over on the SWTOR site, and we welcome your thoughts on the issue in our comments section below! Published by Joshrooms under community news on Mar. 17. 2012. If you are itching to see what game update 1.2 has in store for you, now is your chance. BioWare has officially made their newest update, titled “Legacy”, available for play on the Public Test Server, hopefully a sign that it will be moving to the live game by April as predicted. The Public Test Server now contains a whole lot of the updates we heard about during the Guild Summit, including the big update to the legacy system. Players will also be able to try out a new Operation, a new Warzone, and see the second part of the “Rise of the Rakghouls” in a new Flashpoint that picks up where “Kanon Under Siege” left off. If you are looking forward to trying out all these new features then hop on over to the PTS and see them for yourself. The more testing that gets done means the better experience for everyone when the patch goes to the live servers! For a full list of all the changes in 1.2 be sure to check out the patch notes on the PTS. Published by Joshrooms under community news on Mar. 01. 2012. Do you want to help BioWare test out new and upcoming content? 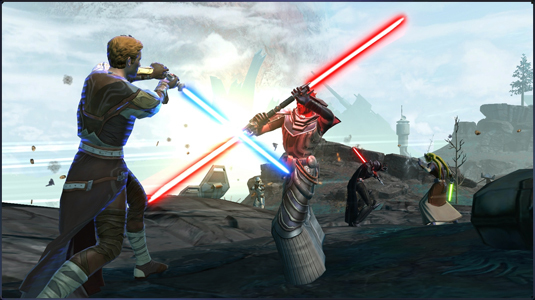 Do you want to be one of the first people to see what is in store for the SWTOR world? Well now you have your chance. BioWare is looking to expand its testing and is looking for experienced players in Austin, Texas to help them test upcoming game content. This includes new Flashpoints, PvP Warzones, and end game Operations. Players will be expected to dedicate at least one weekend an month to testing new content. As an added bonus, this is a fully paid position. That’s right, you can get paid for testing new SWTOR content! If you are interested then fill out and submit this survey. Don’t live in Austin and still want to help out? Well you are in luck. BioWare is also looking to get teams of players from various guilds to help them test the new content we will be seeing in the 1.2 game update. This includes the new Warzone, Flashpoint, and Operation that will be included with the patch. Guilds will need to put together a group consisting of anywhere between 8 and 20 players that will be willing to put their live games aside for a while to test new content on the Public Test Server. You can read all the details and requirements in this blog post. Space is limited, so if you are interested get those applications in soon! Published by Joshrooms under community news on Feb. 22. 2012. The patch notes from the 1.1.4 update are now posted over at swtor.com. Amid the usual bug a glitch fixes are a few special updates that players should be pleased with. The has been an update to some boss mechanics in both the Eternity Vault and Karagga’s Palace. When fighting Soa during the Eternity Vault players will notice that Soa no longer lost threat against his primary target when he casts a Mind trap, and the G4-B3 Heavy Fabricator now has fewer hit point in Karagga’s Palace normal mode. In warzones the queue interface exploit that allowed players to bring extra players into a warzone has been fixed. There is still a chance that imbalances can occur, but players will no longer be able to intentionally trigger the exploit. Also the bug that would cause the east turret in the Alderaan Civil War warzone to sometimes fire twice when captured by the Imperials has been fixed as well. One of the biggest additions with this patch is the promised ability for players to control the appearance of their cooldown animations.. This of course comes as a welcome addition for most players after some displeasure was expressed with the last two cooldown animation updates. Players can now control if they would like their abilities to a flash when the finish a regular or global cooldown, change the art style of the cooldown animations, and chose to toggle cooldown time text on top of the ability icon in the quickbar. For all the notes on this and previous patches make sure to visit the Patch Notes page over at swtor.com. Published by Joshrooms under community news on Feb. 11. 2012. This week marked the first of BioWare’s promised “Community Q&A” blogs where the developers answer various questions posed to the by members of the SWTOR community. They orignally stated that they would be answering 10 questions a week but the players must have hit them with some good ones because they went ahead and answered 15 of the biggest questions concerning the community. Published by Joshrooms under community news on Jan. 19. 2012. BioWare released a new video today which features James Ohlen talking about some of the various new features players can expect to see in the near future. He focuses on four major aspects of future content; new warzones and PvP content, Legacy system upgrades, guild features, and UI customization. All of these features are things that the developers have talked about before, but it is awesome to get to see these features in action. One thing that caught my eye in particular was a Miraluka who appeared to be using Force Charge. That’s right, a Republic Only species using a Sith only ability. Does this mean the legacy system will allow you to roll a previously unusable species on new characters? Only time will tell. What do you think of the new features we have coming our way? What would you like to see that has not been discussed? Let us know in the comment section below.